The Raveonettes close out Culture Collide with a performance at The Echoplex. Consider this. Instead of flying to 12 countries to watch nearly 20 bands, imagine doing this in five city blocks and in the span of three days. Well, you can, And we did. 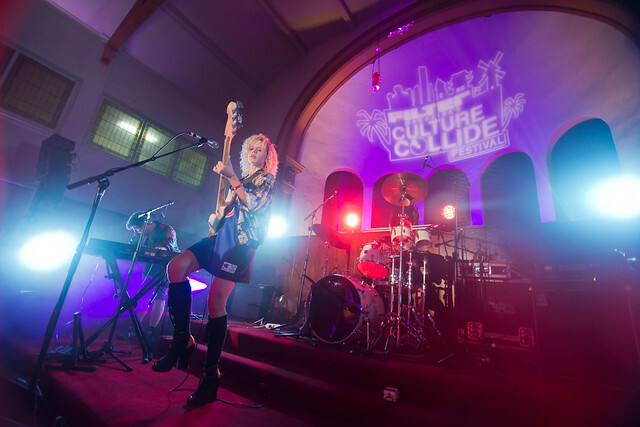 Filter Magazine's Culture Collide, one of Los Angeles' premiere music festivals is unique in that, for any music lover, discovering new music from different cultures can be experienced in five city blocks. Yet no amount of jet lag can stop us from attending day 3 of Culture Collide, now in its fourth year. Day 3 of Culture Collide was going to be the busiest yet. Seven venues including The Echo, Echoplex, Taix and Lot 1 Cafe hosted these bands from around the world handpicked by music curators Filter Magazine ending with Denmark's The Raveonettes at midnight. While IZA's opening night performance packed the Taix Front Lounge, Saturday's show was a more toned down affair playing at The Church where it was peppered with early risers who apparently didn't get bit by the late-night hangover bug. Listening to her whispy and delicate vocals suited this religious environment. And just like the soft, warm glow of the afternoon light washed over the interior, her songs did the same, blanketing us like a warm blanket. Bombay Show Pig on The World Stage presented by Ernie Ball. While outside at the World Stage presented by Ernie Ball, Bombay Show Pig did their best to wake up the early show crowd and the city for that matter. In what has to be my favorite band from Culture Collide, Bombay Show Pig has a name that quickly grabs your attention while it's their music that keeps you from leaving. For a band that plays loud and fast, they certainly layer their tunes with infectious melodies and travels from 0 to 60 in a quick heartbeat. 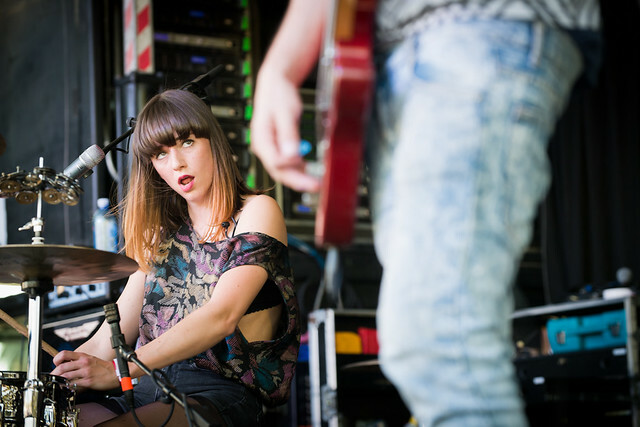 They played fierce and heavy while both Linda van Leeuwen and Mathias Janmaat traded vocal duties. It's that collaborative balancing act that teeters on the edge of no return and they manage to stay dangerously close to the edge without falling off the cliff. Back at The Church for a double-billing of Brodka and Maya Vik, two gals who can do it all, converting The Church into one big dance hall. First off, Brodka. She's Poland's Pop Idol winner and it's easy to see why. Her addictive stage presence is highlighted by the strength of her pop songs just like her english song "Varsovie," a ticking time bomb of a song that delicately starts off slow like a lullaby before it lifts off into rising chorus that makes you want to reach for the sky. From pop songs to a little funk, Maya Vik got everyone in The Church standing and dancing. Decked out in New York Knicks jersey, Vik brought a little bit of soul, a little bit of R&B and a whole lot of attitude. It was fun to see late arrivals enter The Church, expecting to see a serene and toned down environment, enter to see a lively crowd having the time of their lives. Alice Russell at The Echo during Culture Collide. 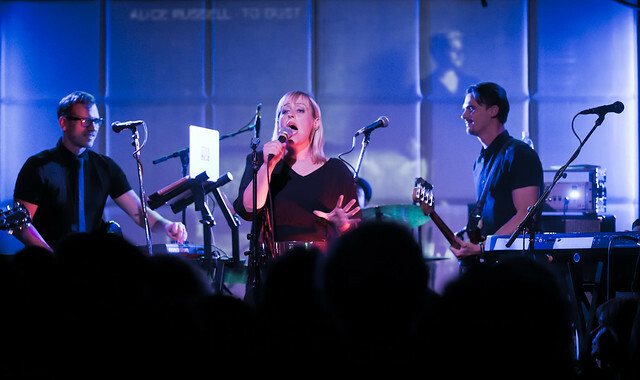 Alice Russell performed to a packed house at The Echo ahead of headline show at The Glass House in Pomona. Coming from a musical family, Alice wowed the crowd with her soul inspired tunes playing songs off her new album To Dust, released earlier this year. 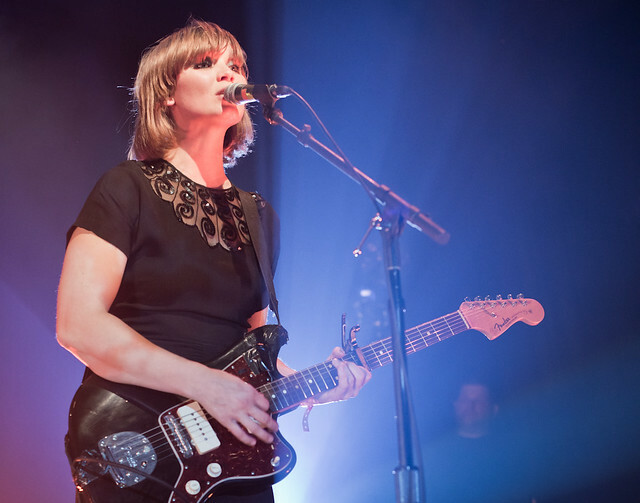 With a powerful voice that felt as though the thin walls of The Echo couldn't hold, Alice along with her backing band made the smokey venue hot and sweaty, feeling like I was transported to the old underground bluesy and jazzy clubs of Chicago. Brooklyn's Heliotropes at The Echoplex. 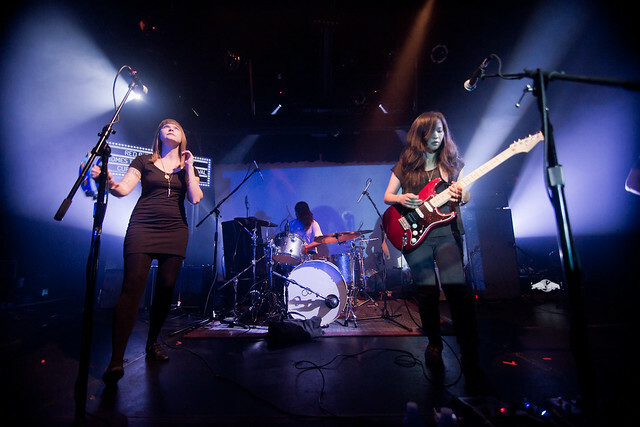 I didn't know anything of Brooklyn's Heliotropes before they performed on The Echoplex stage. They were a welcomed surprise. Their psychedelic-grunge tunes are like standing on that dirty, tiled, subway platform waiting for that last train only to be greeted with that cold gust of wind pushing through that darkened tunnel. It's a chill that leaves the hair on your arms rise. And that's how I felt when I first heard The Heliotropes. With backing vocals from Amber Myers, frenetic drumming by Cici Harrison and steady bass by Nya Abudu, add lead singer Jessica Numsuwankijkul vocals and Heliotropes echoes Mazzy Star's Hope Sandoval if she was in a rock band. Newly improved Gliss 2.0 are high-glossy and shimmery like a new minted coin. 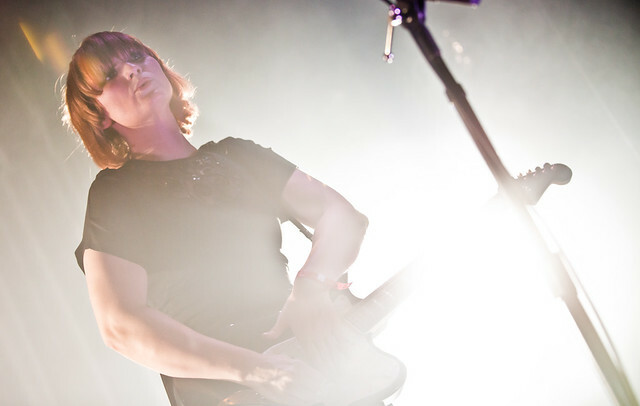 Gone are the days of alternative-rough guitar riffs and say hello to the electro-shine and hazy-dreamscape melodies. 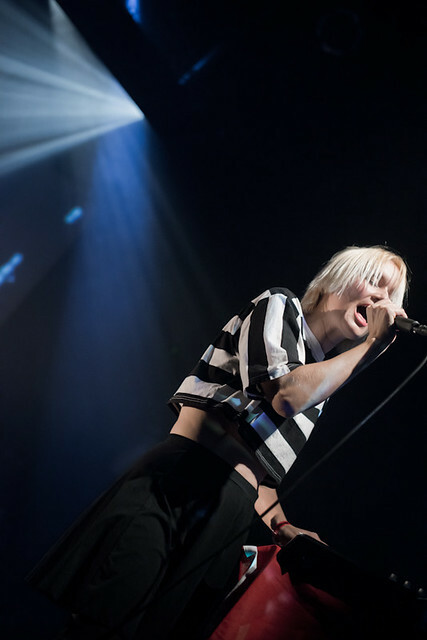 With any other band, such a departure would have been disastrous but with talent consisting of Victoria Cecilia and Martin Klingman, who have toured with Raveonettes and Smashing Pumpkins, Gliss' rebranding has led the band into a career resurgence with the release of Langsom Dans, released earlier this year. Gliss has focused their sound like a laser-light, with music tastemakers raving about their dark, art-pop sound as evidenced by their single "Weight of Love," which, as we described when it was released as "...a beautiful song with impressionistic dreamscape melodies filtered through the serene vibe of west coast sunsets..."
The Raveonettes are on my bucket list of bands to see so I was thrilled to finally see them perform. 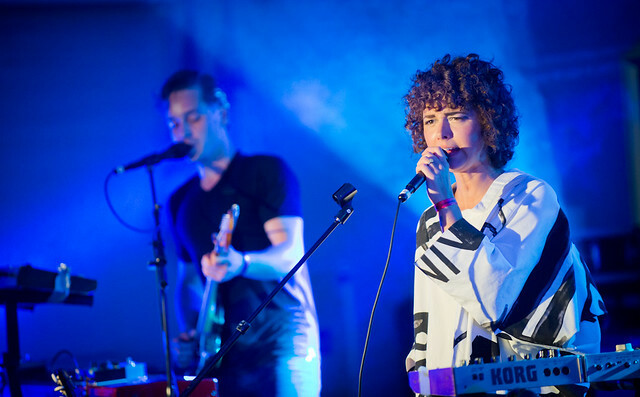 The duo from Denmark closed out Culture Collide, taking the stage at The Echoplex at a little after midnight. Bathed in saturated reds and blues, The Raveonettes made up of Sune Rose Wagner and Sharin Foo spent their set playing through their nine year discography - from 2005's Pretty In Black with "Sleepwalking" to 2007's Lust Lust Lust's "Blush" and "Dead Sound" up to "Curse the Night," "She Owns the Streets" and "Young and Old" off their newest album Observator which was released last year. The Raveonettes at The Echoplex. And with that, Culture Collide ended with a bang. By weeks end, over 60 bands from over 25 countries called the five block stretch of Echo Park home for three days. 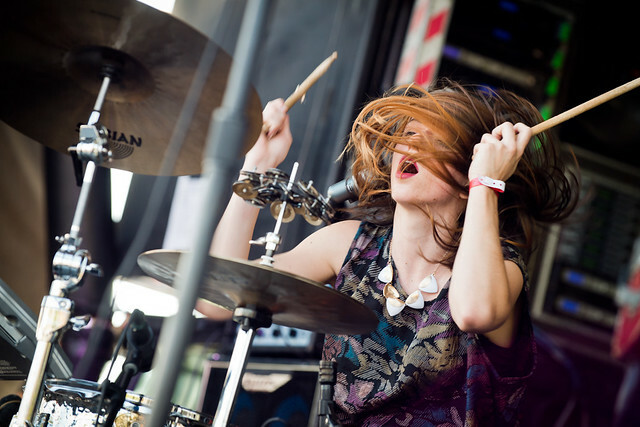 New bands were discovered like Bombay Show Pig, Float Falls and Like Swimming while old favorites like The Raveonettes, Secret Shine and Bleached showed the newbies how to be great music ambassadors. Check out more photos from Culture Collide on our Flickr page right HERE.